My Creative Time: Happy Mother's Day!!!!!! Don't forget to leave a comment here for a chance to win this FUN cartridge sponsored by Custom Crops! OMG, I love the pink Supermom!!! Just awesome card!!! I'm trying to be a mom, but so far no joy.. So today, I will be calling mine, I live too far to go see her :( , relax and craft a little, lol! I loved this card when you posted it the first time - and I STILL love it!!! Have a happy Mother's Day! I will be visiting both my mom and mother-in-law today, and spending the rest of the day with my hubby and two sweet daughters! I hope you have a great day my friend!! It IS the cutest card ever! Happy Mother's Day to you, Emma!!! This card ROCKS! Happy Mother's Day to you, Emma. Happy Mother's Day. I love the card. Way to make it work for a mom! Happy Mother's Day! My husband has the flu so we are staying home today. I am going to spend time crafting with my two little sweethearts (6 and 3 year old girls). Happy Mother's Day to you as well. I have some of your stamps and can I tell you I lOVE them can't wait to order more. This is a super Mother's day card! You have a super day, Emma! Love that card and cartridge. Happy Mothers Day to you also. Great card!!!! Love the chance to win...I'm having myself a pj/no cooking/only fun day...and maybe some cardmaking thrown in to the mix to make a truly perfect day!! Happy Mother's Day!! Today is a bittersweet day for me. Today is my sister's birthday, mother's day for me and also the 2nd anniversary of my father's passing. My mother, daughter and I will be spending the day together and then we will go over to my sister's for dinner to celebrate her birthday and keep her busy so hopefully she will not be too down about our father. I hope you have an awesome day today with your family! I also hope that your husband is feeling/doing much better! Happy Mother's Day!! I plan on doing nothing today! My mother is hard worker all week and all she wanted to do for her day is laying in our pajamas and watch movies in bed. :) Thanks for the chance to win! Happy Mother's Day Emma! I remember this card becuase I LOVE it ~ but then again when don't I LOVE all your creations! My day is jam packed! I will surrounded by the best people in the world...my family! I hope you enjoy the day! I love your comment of us wearing many, many different hats... how true! Have a great Day! Happy Mother's Day Emma!! I am going with my sister to my mom's house and going to make her dinner =). Enjoy your day!! LOVE your card Emma---so cute how you turned a "boy" card into a great card for a mom!!! Happy Mother's Day to you and the other Super Mom's out there---thanks for the awesome give away chance!! I absolutely LOVE this card! It's amazing. I hope you have a wonderful Mother's day, you have more than earned it! Such a great card! Happy Mother's day to you! For Super Mom Emma Aguilar: Happy Mother's Day Emma!!! Superman did have a Super Mom! Love this pink card. I will be relaxing today and thinking of all the Moms in my life that are no longer with me. Happy Mother's Day, Emma! I had surprised 30th birthday party for my hubby last night so we celebrated with his mom then and then this morning went out for breakfast with my Mom. It was a SUPER fun weekend :) Thanks for the chance to win! Beautiful card...I've been wanting this cart for a while now... My kids gave me brekkie in bed and then they have gotten along great so far so I' m hoping it continues as we finish the day with dinner at my fave pizza joint...Happy Mother's Day, Emma and thank you for all your inspiration! Happy Mothers day Emma!!! Awesome card!!! Happy mothers day emma! Today we are bbqing and celebrating all the moms in our family. I love your card, every mom should get a card that reminds them how super they are. Happy Mother's Day! I love your Mother's Day card. I am spending my day with my boys (8 & 7 years old) and hubby. Thanks for the chance to win. Love the card! Would of never thought to use a superman cartridge....so creative. I will be spending my mothers day with my babies and do dinner with my mom. Such a cute card!!!! I love that you used the Superman symbol for Mothers Day....so perfect!!! Love the colors too! Thanks for the chance to win this cart! Happy Mothers Day to you!!! Such a cute Mother's Day Card. Who would think to use this cartridge?? You are so creative! Great job~Love the card! Happy Mother's Day to you and thanks for a chance at such a great giveaway! I LOVE your card Emma. So pretty. Such a creative way to use that cart! Happy Mothers Day to you, I hope you are doing something very special. Wow, you look amazing I never thought you were even close to 40. I am heading out to dinner with the DH and kiddos. :) Enjoy the rest of your day. What a great card.... I love that you took someting and made it someting completely different!! Hope yo have a great birthday!!! I love it- Supermom! Well, I spent time at church and with my boyfriend, then started relaxing by reading my favorite blogs. My Mom is far away but will be home tomorrow. Thanks for the chance to win! What a great card, look at my avatar and you'll see why I love it! Hope you have a great Mother's Day and a very Happy 40th Birthday! I am enjoying family time with my kids and hubby, it's just perfect! What a beautiful card! I love the Superman logo in pink!! Happy Mother's Day Emma! I hope your day is loaded with extra love and sweet hugs! Love the card. Happy Mother's Day Emma! Your card is beautiful like always. For Mother's day my little family just hung out together and when to a couple stores. Happy Mothers Day Emma! Your card is beautiful...STILL! I spent my day in the car traveling back home from my last daughters wedding. Exhausted and my bed is calling me! Hope your day was splended! Your card is adorable. We took my Grandmother out to the Olive Garden today. Thanks for the chance to win. Happy Mother's Day Emma! you so such an adorable card. I spent my day with my In Laws and my mom in church and lunch. It was wonderful. My children behaved nicely especially my 2 1/2 year old son. Thanks for the chance to win. Happy Mother's Day to you as well. What a fabulous way to use what is normally considered a masculine cart. I love it! I spent a fabulous day with my 2 children and husband. They spoiled me rotten with crafting goodies. Thanks for the chance to win this great prize! Happy Mother's Day! It's been a wonderful day today. Heard from family members and took my mom out to eat at her favorite restaurant. Thanks for the opportunity to win this cartridge. Happy Mother's Day! What a super card! Happy Mother's Day, Emma! I started the day with a wonderful family breakfast that included my mom and dad (they came for an overnight visit). We then headed out to cheer on my daughter at a horse show. A great day! Happy Mother's Day to you :) I hope you had a wonderful and relaxing day! I had dinner with my mom tonight! Great day! Thanks for the chance to win! Happy Mother's Day to you! I had a wonderful day. After church my family took me to the local Joann's for unlimited shopping. I took it easy on them, but it was awesome. I also have a Michael's card and a card for lunch and enjoyed the afternoon on our deck with all my kids! What a day! Thanks for the chance to win a cartridge! Happy Mother's Day!! 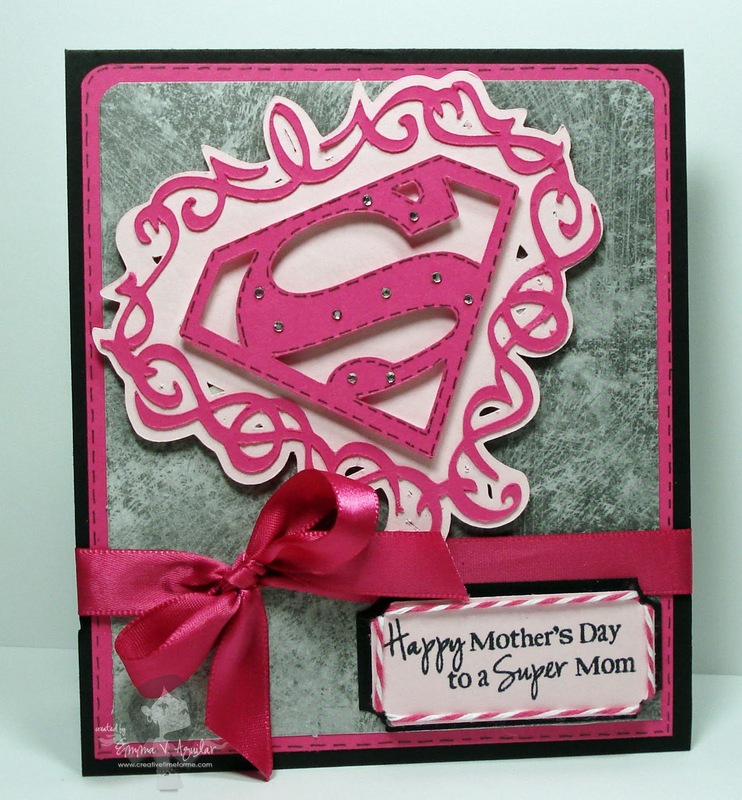 I love your pink Super Mom card!!!! This cartridge would make a great BD gift for my DIL, who's BD is this coming week!! Thanks for the chance to win!! Thanks for the chance to win this cartridge! I spent this day first with breakfast at my Church, with a Special Mother's recognition during services. Next, My Husband's Mom and Sisters and Brother, my Children and extended family had a wonderful meal at a local restaurant. This carried over to my Mother-in-Law's home and finally ended the day going to the movies to watch Fast Five. I did sneak a nap in there too!! A Wonderful Day!! I hope yours was just as wonderful! I love that card, Emma! Happy Mother's Day to you, too! My husband and BIL bought lunch for everybody - takeaway which we ate at my mother's house. We then spent the rest of the day enjoying each other's company. I hope that you also had a wonderful day!! I had a house full today - no rest for me! We gave each mother a red rose to take home and enojoy. - a total of 18 roses! What a pretty in pink card. Love the S and of course the great sentiment. Happy Mothers Day, I love your card. My daughter and snl and grandkiddies came for supper, which made for a perfect day. Thanks for the chance to win this great cartridge. Super card. Just adorable. I went to a birthday party and then spent the evening with family. I love this idea, had no clue you could do this with the cartridge. Thanks for sharing! Great card! I really like this cart and how you used it. Thanks for the chance to win some awesome blog candy! Happy Mother's day! Very cute card! TFS! I love the card! Today I spent the day making space in my game room to set up my craft space, I am so excited that I finally got it set up and am ready to start my scrapping! I did make a 6 of the 3-d bags that I scraplifted from The creative keepsakes blog! I am so ready for next weekend, I am going to scrapbook all weekend! Oh yeah,I m also going to start my blog!!! Btw, if I won this cart I would totally scraplift this card!! What a great card! Hope you had a great day...after the kids made me breakfast in bed (with a LOT of help from Dad), my hubby and his friend (who has a son right in between our children's ages) brought the kids to play basketball and for a swim so we moms could have the afternoon off! Then we went to Maggiano's Italian Eatery for dinner (for the best family style yumminess)!!! Happy Mother's Day. Super card. I'm just visiting my favorite blogs. Wow! This card is amazing! I love you take a boy cartridge and manage to make a great girl project with it! TFS! HAPPY MOTHER'S DAY EMMA! Thanks for the chance to win! I got to spend the day with my entire family. We did a pot luck at my cousin's for all the moms! Happy Mother's day to all you Super Mom's out there. Darlng card. Happy Mother's Day Emma. Love the "super" card. I so love that stamp set, I have used it over and over! Love your card's and all your great ideas. Thanks for a chance to win. Happy Mothers day to you too! Hope you had a great day! I spent the day with my hubby and 2 sons...my boys are always so sweet especially on mothers day. They made breakfast and Starbucks coffee...it was delicious!!! I love your cute card! Sometimes I feel like I need that "S" on my shirt so that I can be at two, three, and sometimes four places in a blink of an eye. LOL! Thank you so much for your wonderful creations and inspiration. Take care and have a great week! Emma your card is so poignant in its simplicity because "super" covers the whole gamut of motherhood. I never thought I'd have any use for this cartridge, but you've shown (again) how to think outside the box & give something a different angle. Thanks! Emma, what an adorable card! Super sweet! Love it. I love this card...what a great way to use the superman S! Super card! For Mother's day I went shopping with my kids. What a sweet card! Thanks for a chance to win! Hope your Mother's Day was as sweet as you are! happy Mother's Day Emma and what a fab card you have made! I do not have this cart and would love to win it. My brother is a huge, huge superman fan. Loved this card....so super! I spent the day helping our oldest with a video bigraphy report that isn't due until Friday...but with her crazy sport schedule right now, it had to be finished. Then I woke up to her not feeling well in the middle of the night last night....a mother's job is endless, but I love every minute of it! Love the super mom card. Super and feminine all at the same time. what a super way to use this cartridge, we didn't do much on mother's day because I had a bad fall in the ice rink on Saturday. I like the Super Mom card and I like the cartridge. 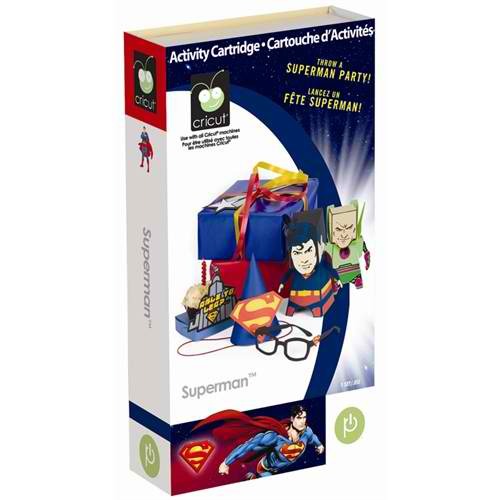 I bet you can even make a great father day card with this cartridge. Thank you for sharing. Emma ,I so love all my stamps I've got of yours. Almost have them all. Also thankyou for all your work. I love it all. I love your card. It reminds me of when my son was a little boy, he thought I was wonder women lol. Well now he's my all American hero. I would so love to have this cartidge to make cards so he can send them home for his little boy. Blessings. Tammy A. Love the card and the unexpected cartridge you used for it :) Hope you had a very blessed Mother's Day! What a great card Emma!! Hope you had a Happy Mother's Day. Love your Super Mom Card! My family took me out for breakfast. I loved it! Have a super day, Emma! Spending time with my fam of course! Happy Mother's Day to all the mommas! Thanks for the opp! Your card is super cute!! Happy Mother's Day!!! My family had a barbecue. that is a great card!! This is such a cute card, love it. Love how this card turned out! I love your card! I know a few SuperMom's I could make it for! I spent a great day with my family! SUPER cute card Emma! Hope you had a fabulous Mother's Day! I had a lovely dinner out with my boys and got some quiet (NO FIGHTING) crafting time! I enjoyed painting with my girls and a yummy family dinner! Love the card! Such an awesome "out of the box thinking" way of using the Superman symbol! Love it in pink! :) I didn't do much on Mother's Day since my husband works overnights and is not off until this coming weekend. I took my daughter's out to do a little shopping and errands (they are 1 and 2 so they don't get the whole Mother's Day thing yet). I had gotten together with my mom on Friday to celebrate with her since she also works overnights. LOL Thanks for sharing your card and all the other awesome projects on your blog! Happy Mother's Day! I worked on scrapbooking and just hung our with my three kiddos and hubby! It was a perfect day! Fantastic card. Just love that the symbol is in pink my favorite color. Thanks for the chance to win. I love that card! I spent Mother's day with my wonderful mom.